Pallet flow rack is a common go-to for streamlined storage and order picking applications. Now modify that pallet flow lane with a few key Mallard accessories and this simple workhorse becomes a thoroughbred for finished goods assembly. 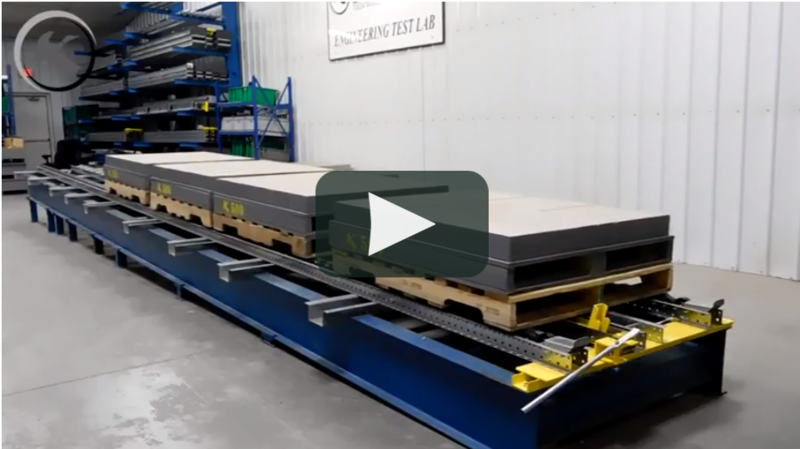 This was exactly the case for a national home goods retailer who turned to the Mallard Engineering Testing Lab to improve efficiencies in their small piece furniture assembly area. The concept – replace bulk stacked pallet staging with custom, gravity-fed pallet flow lanes that would deliver the pallets safely and efficiently direct to the finishing area vs. depositing one by one by forklift. Pallet flow staging minimizes traffic, increases safety in the area and eliminates downtime of waiting for parts to arrive. 2-rails of staggered wheel pallet flow each set to the outsides of the flow lane, 39” out to out. 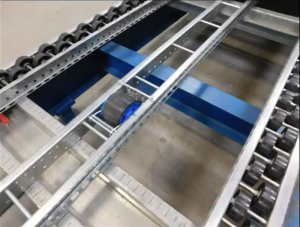 No center pallet flow rail… instead, direct mount speed controllers spaced at 60” intervals. 7/16 per foot pitch in 30’ lane safely accommodates up to 6 pallets deep. Load weights acceptable up to 500#, higher weights may require configuration modifications. FS-200 Flex pallet separator modified with release handle. The design is predicated on using standard GMA-style pallets… in good condition. What does that mean and why? Good condition means that they are uniformly built to ensure proper product weight distribution and free from broken boards or loose nails. It also means they have three bottom rails to prevent sagging in the center which would hang up the load along the center-mounted speed controllers. Mallard’s direct mount speed controllers are aptly named because they make direct contact with the bottom of the pallet to slow the pallet as it progresses down the lane. In this system, we placed them at 60” intervals to ensure that the pallets are always in contact with a speed controller until the point where the pallet is stopped by the pallet separator. The flex separator is used for high-volume, floor-level case-picking in moderate to deep lane configurations. The pallet separator holds back the rear pallets from the front pallet so that workers can simply and safely remove empty pallets from the front pallet position. Typically, the hold-back mechanism is triggered with a foot-operated release, but in this case, we were able to modify it by adding a handle that extended to the side of the lane. As you can see in the photo to the right, once the front pallet position is empty, the worker lifts the handle to trigger the pallet separator to release the rear pallets. Those pallets index forward until the front position is filled. At that point the rear mechanism of the flex separator kicks in holding back the rear pallets 4”-6” from the front pallet. The front pallet is now isolated and free from heavy and potentially dangerous rear pallet forces. 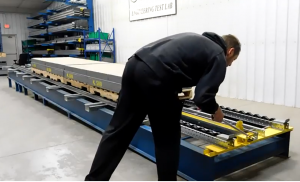 A custom designed pallet flow lane like this can improve assembly times, inventory processing, free up expensive floor space and increase warehouse safety. Give us a call and let’s talk about the solution that is right for you.